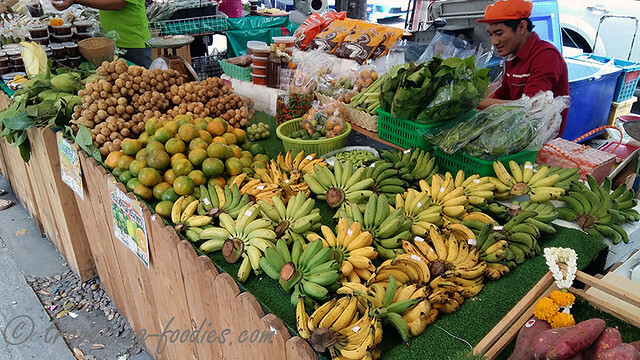 There are some stalls selling fruits and local produce situated outside the main market. 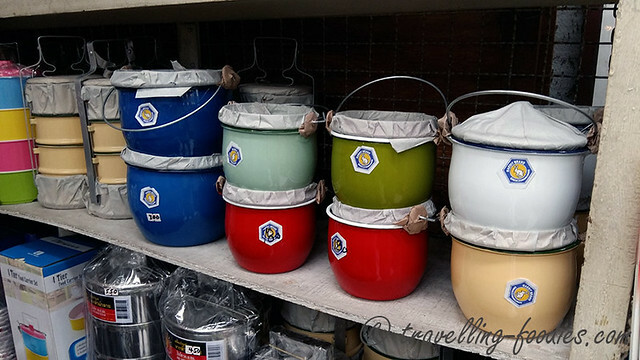 One doesn’t have to get inside to start shopping! 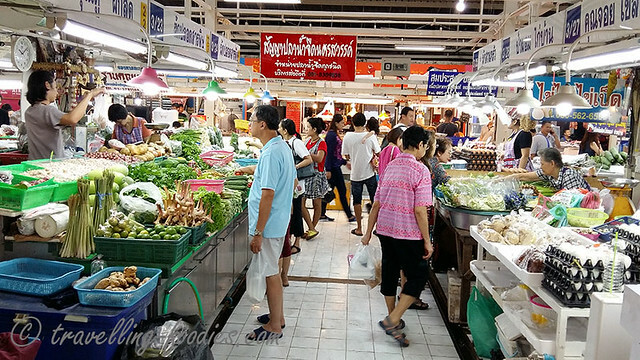 As one steps into the market, one would be in awe by two things, first how spacious it is and then, how clean it is. 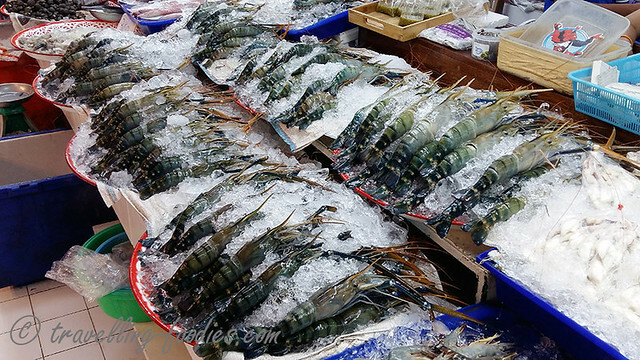 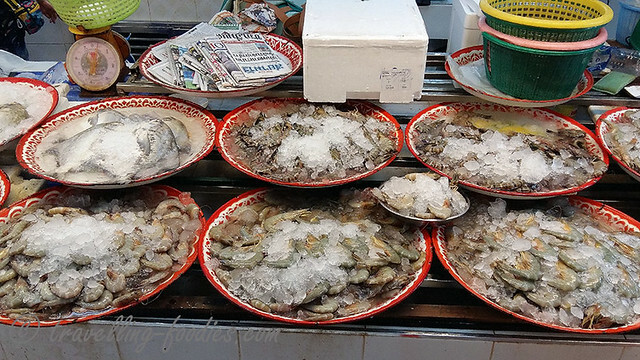 The seafood stalls are found right near one end of the market. 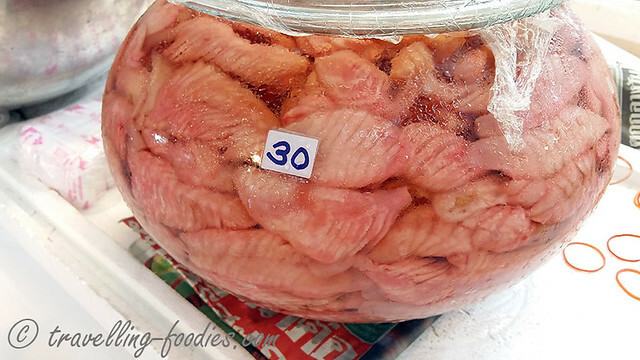 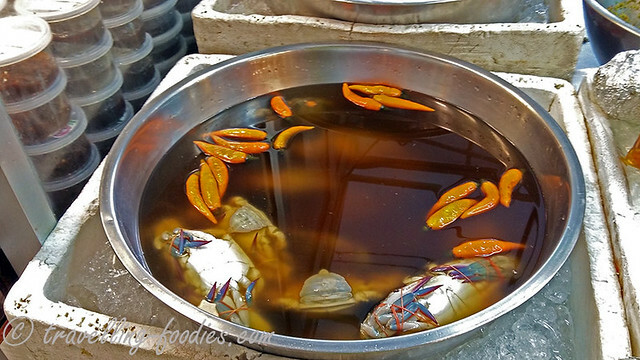 Gigantic freshwater blue shrimp aka Kung Pao for grilling or tom yum! 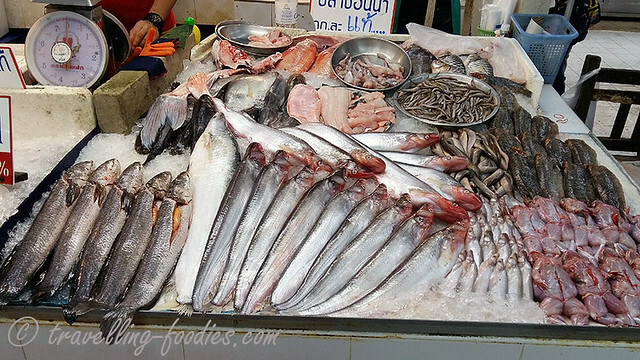 More seafood… The Thai Chinese who are mainly Teochews love pomfret!I love how the catch of the day are displayed in those vintage-looking enamel trays. 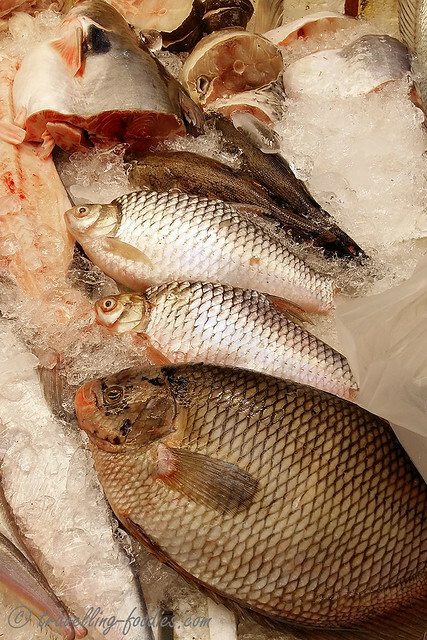 Freshwater carp and related cyprinids… not my favorite fish at all… those marbled goby aka soon hock buried in ice at the back are though! 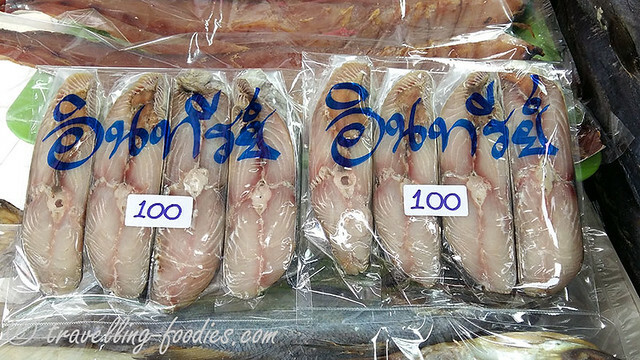 A range of snakeheads, catfish, baby eels, filleted gigantic toman and skinned frogs…we kept the walk around the fresh seafood section short since we can’t lug back any of these home. 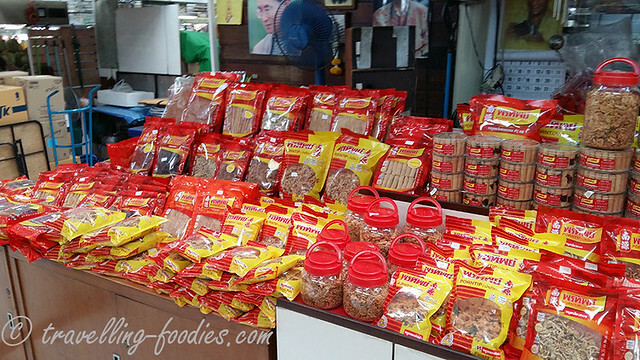 The selection does offer interesting things though. 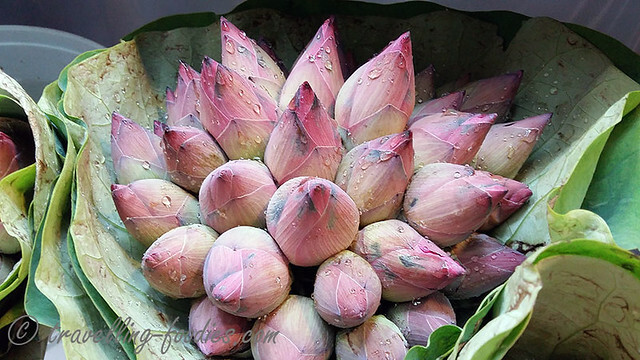 An eye opener. 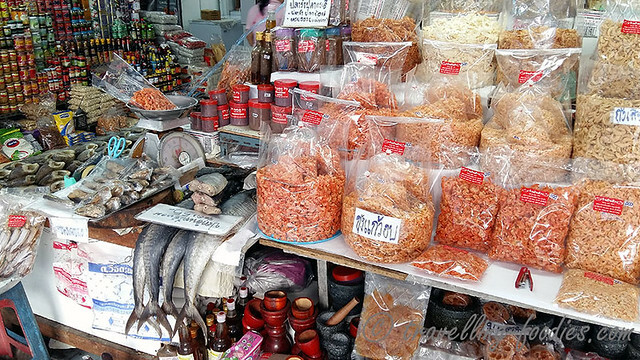 Then we reach the dried good section, most apparent from the lingering umami aroma of the variety of dried shrimp of all sizes and grades available. 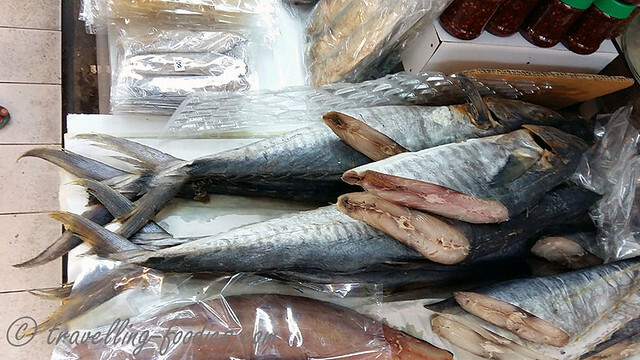 The slabs of salted mackerel look good! 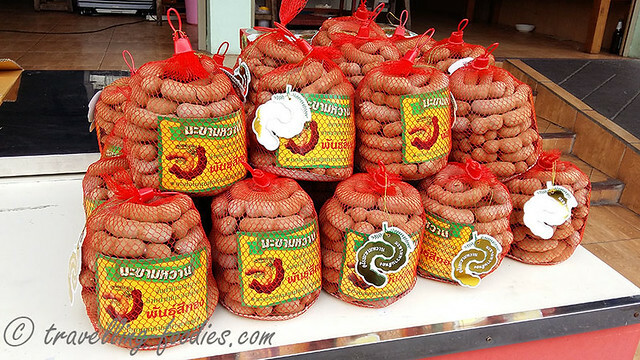 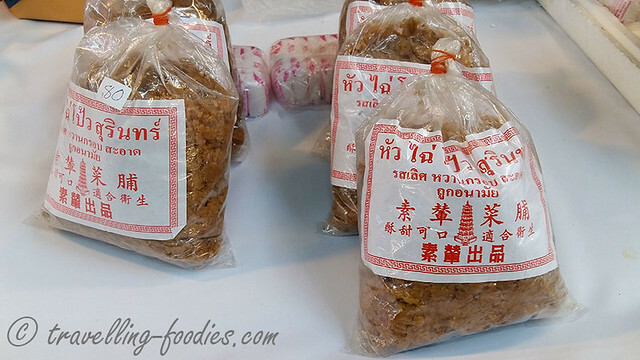 best fried until crispy or simply steamed over minced pork to go with a warm bowl of porridge. 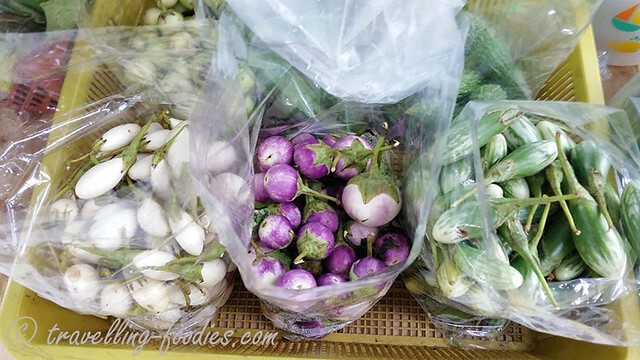 Different varieties of brinjal aka aubergines… good for cooking curries! 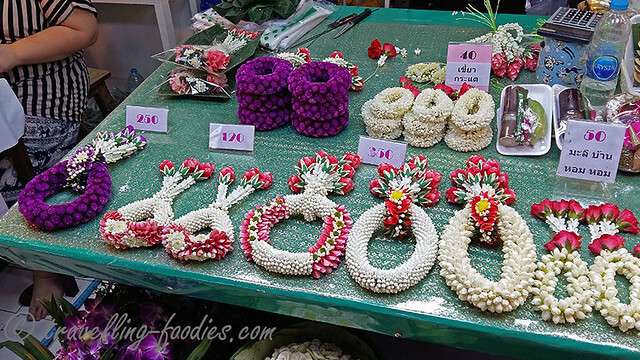 fresh garlands crafted out from jasmine, rose and other fragrant flowers as offerings to the Buddha. 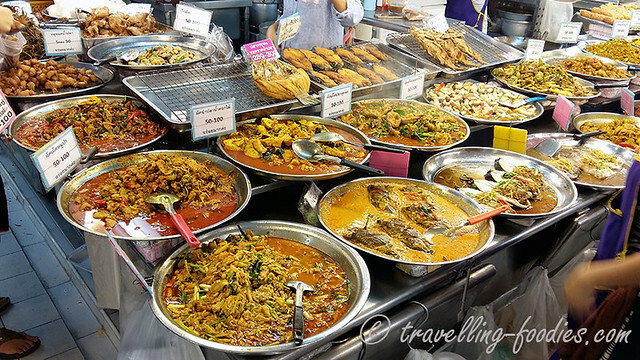 more cooked dishes… i wish I had the stomach space to try a bit of everything!!! 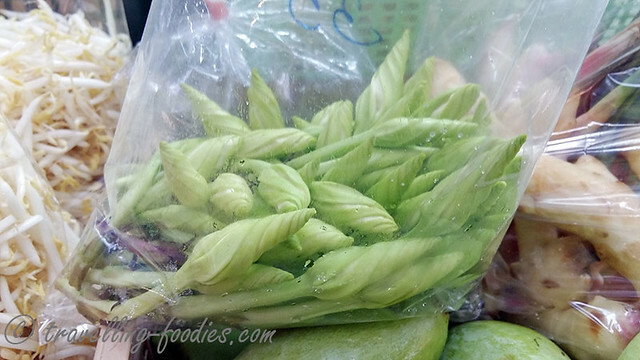 Lightly blanched greens to go with a sour and spicy sauce… the very thought of it makes me drool! 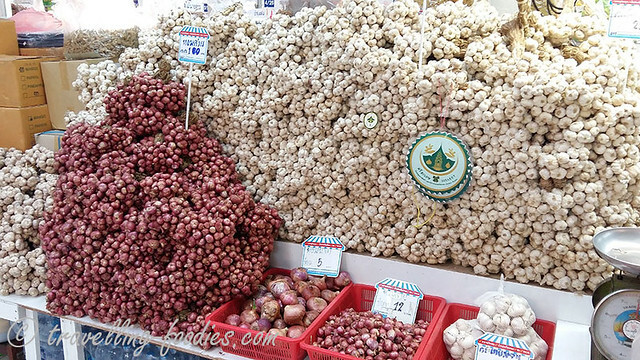 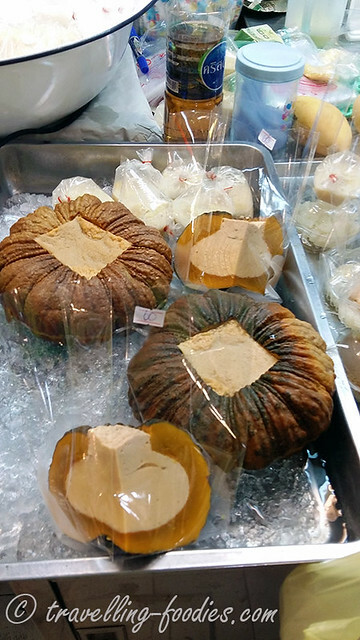 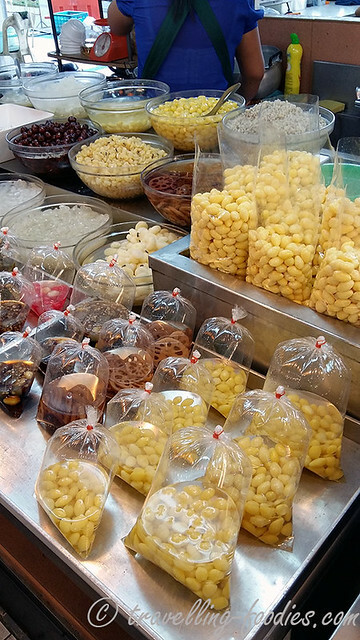 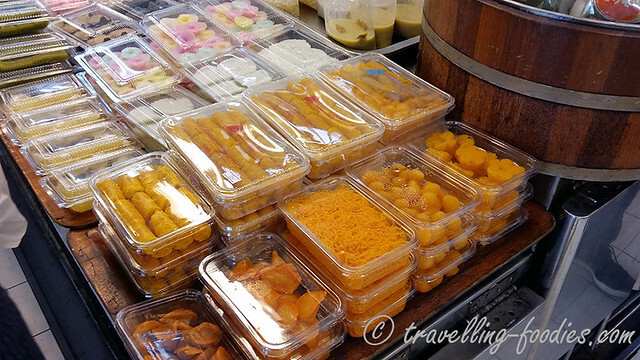 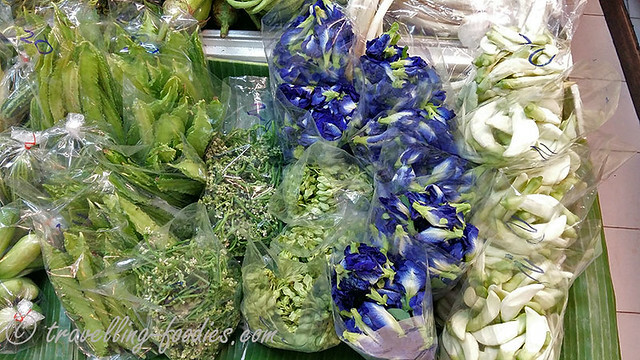 candied gingko nuts, lotus roots etc… for sweet desserts. 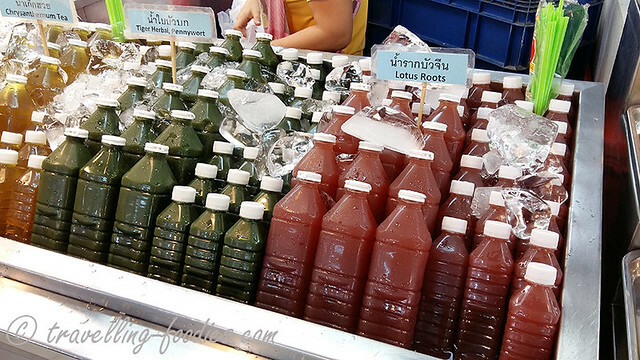 Pennywort aka daun pegaga and lotus root juice… the former tasted really “grassy” but known for its medicinal effects of relieving heatiness. 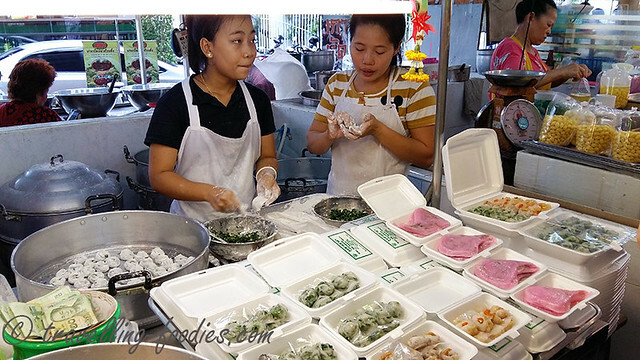 They are all made and steamed on the spot! 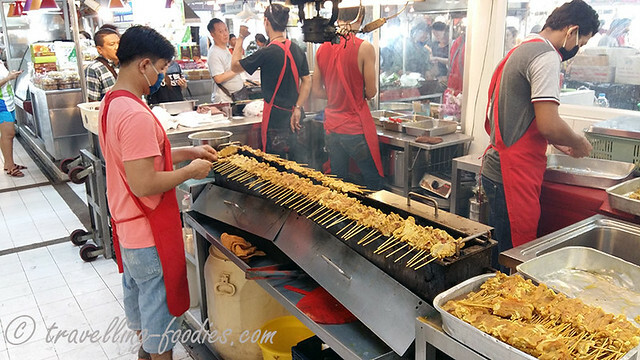 The back of Or Tor Kor Market is a small “hawker centre” with a dozen of food stalls or so and seating area for diners to enjoy their food on the spot. 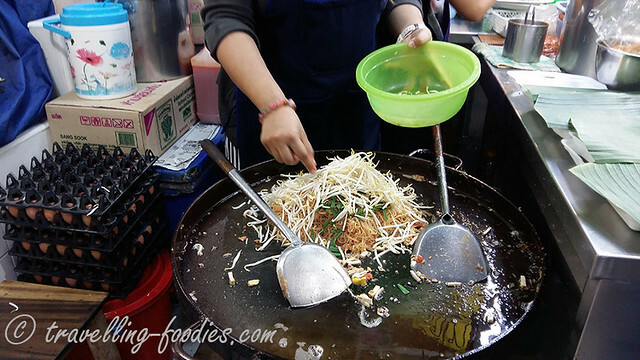 Many choose for takeaways to eat within the comforts of their homes or offices to beat the Bangkok heat..
Fried noodles prepared upon ordering… smelled so so good! 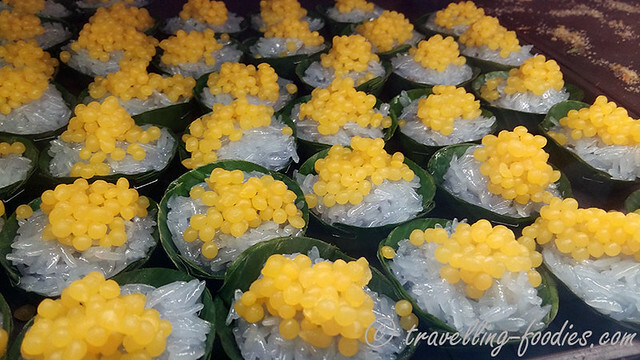 Small selection of glutinous rice based sweets,, some topped with grated coconut cooked in palm sugar, some with egg and coconut milk custard aka sangkhaya. 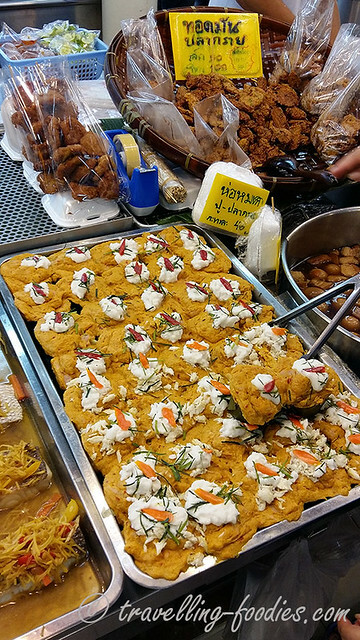 A slice of the Sangkhaya Fa Thong… this is good!!!! 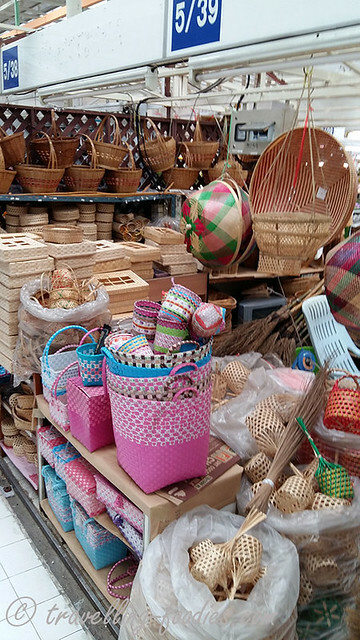 A shop selling items woven out of bamboo or rattan…. 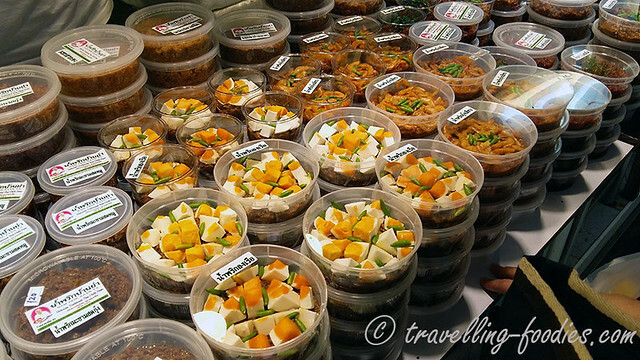 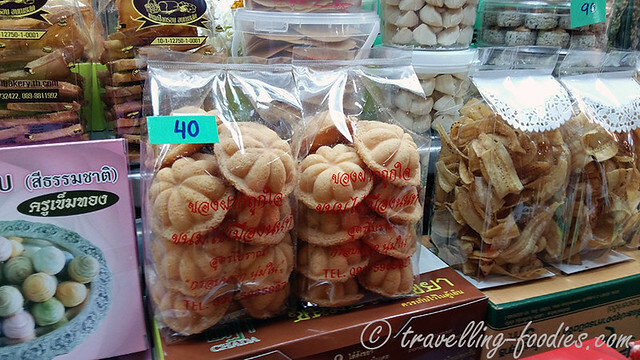 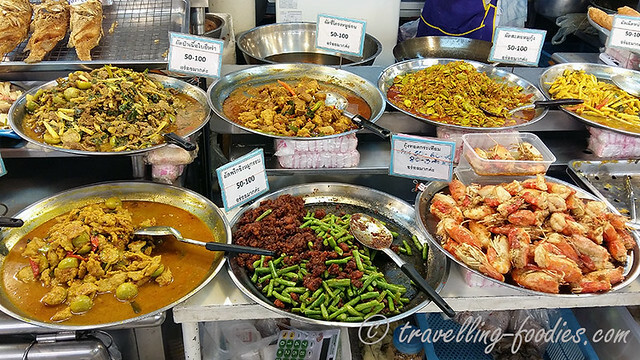 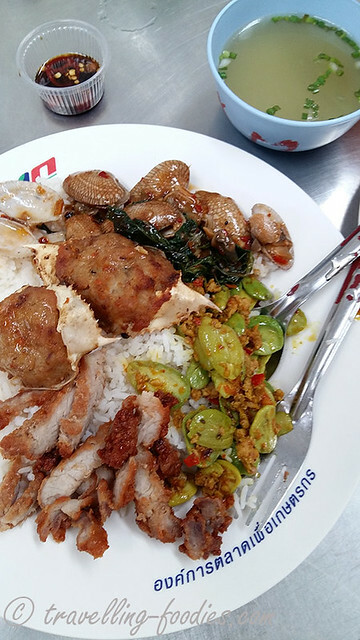 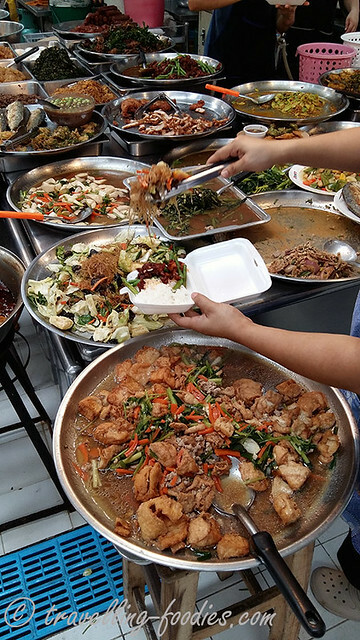 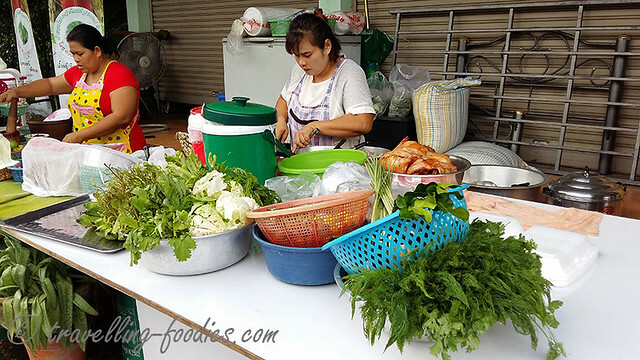 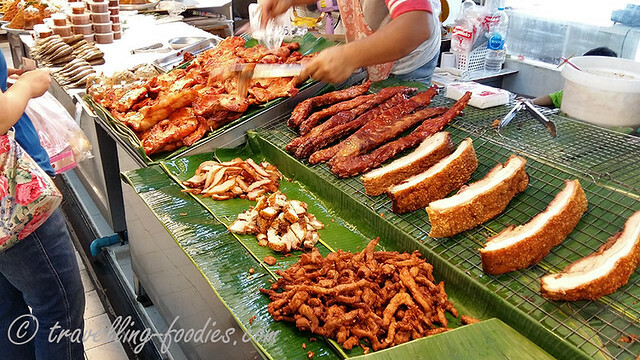 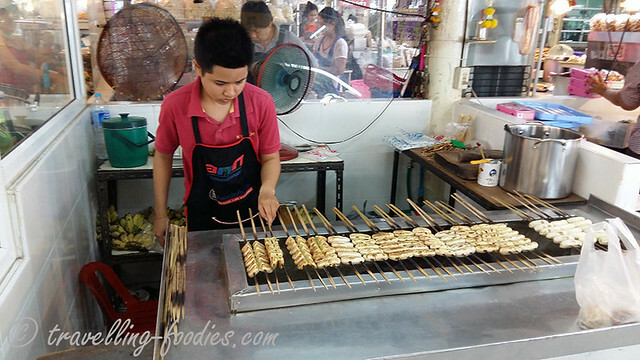 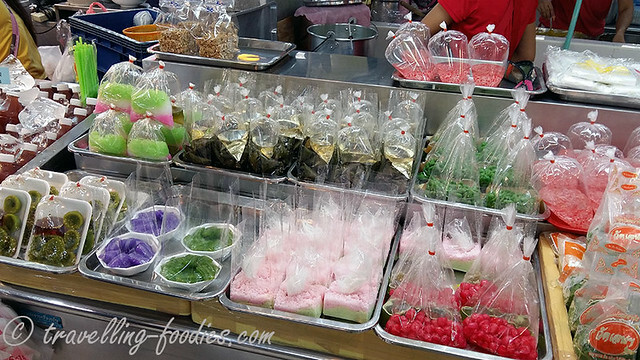 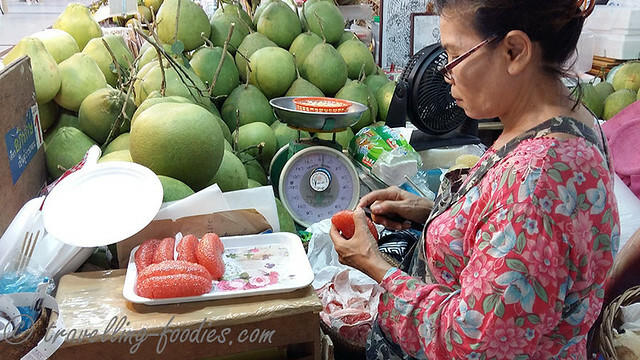 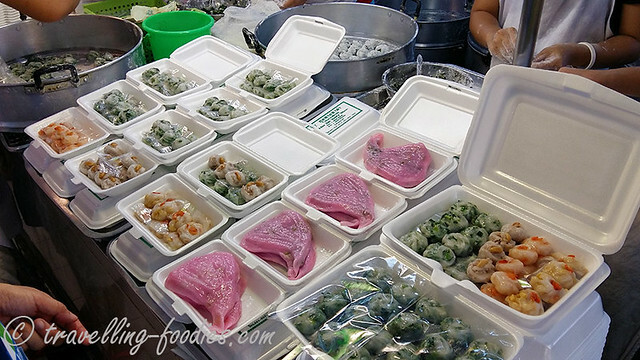 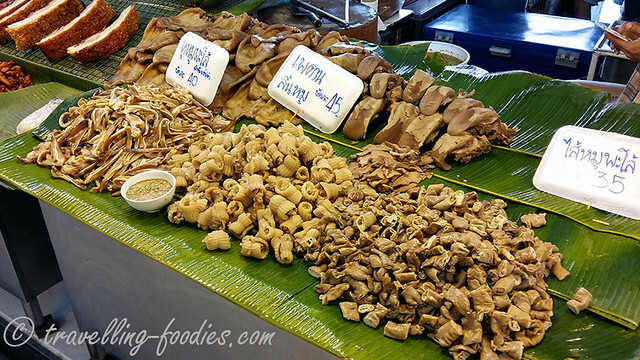 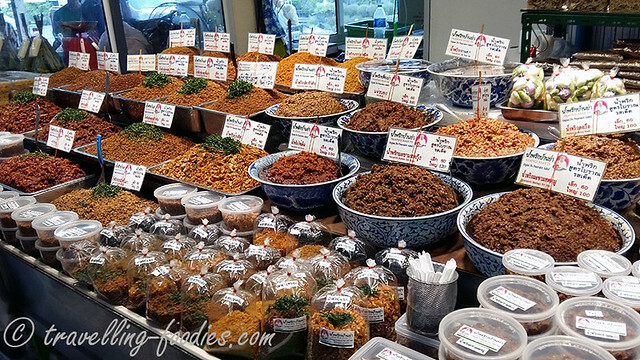 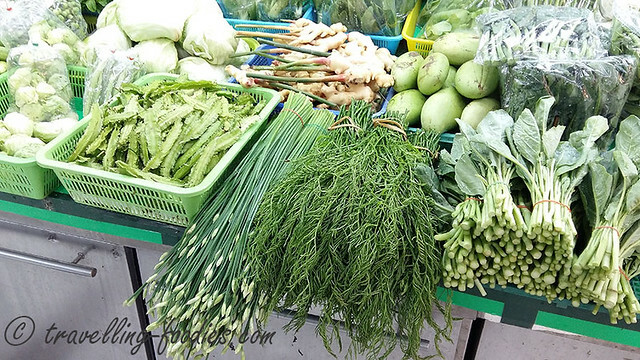 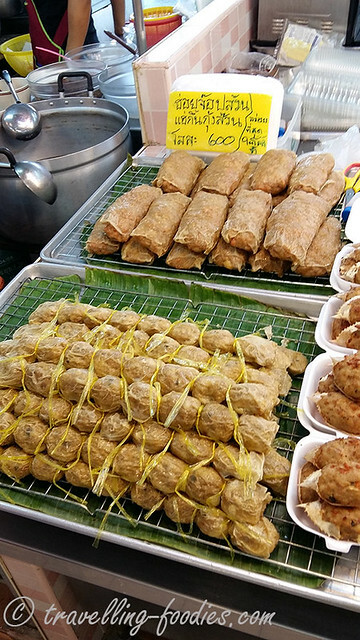 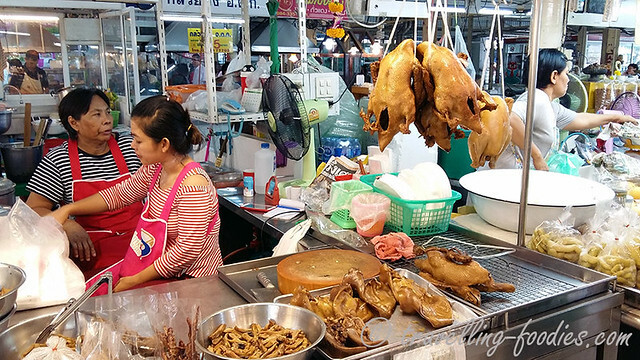 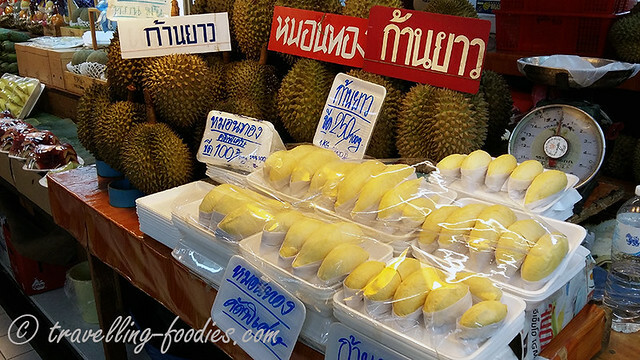 If one only has limited time to explore Bangkok but wishes for a glimpse of what and how the local Thais eat and buy, I think Or Tor Kor Market is definitely a good place to visit. 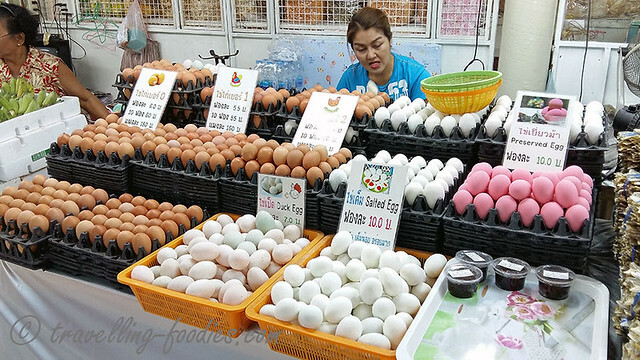 Yes the prices of food items here maybe slightly higher than those peddled along the streets, but it is still very much affordable and the levels of spaciousness, cleanliness and hygenie more than make up for it. 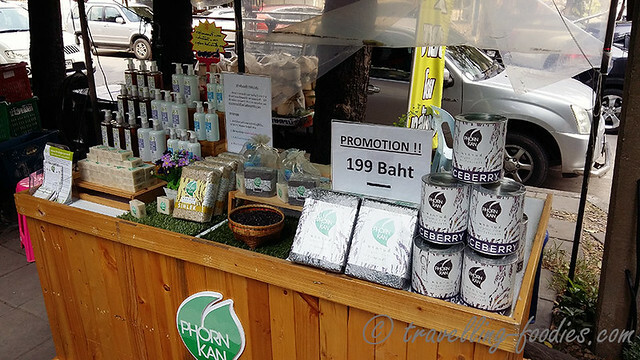 That said, beware of tourist traps as always, simply smile and walk away after saying “khor pun khap/kha” if the price given is higher than what one is expecting to pay. 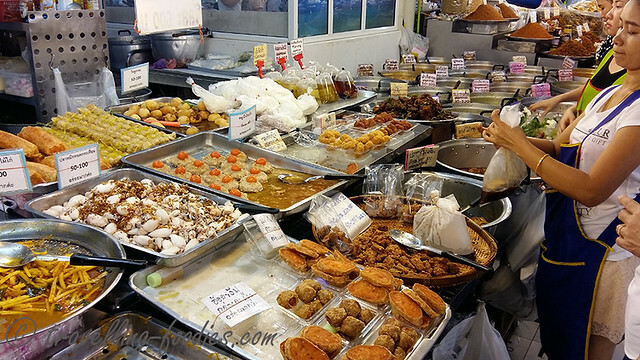 There are usually many stalls selling the same stuff so competition would be quite stiff I gather here, so don’t bargain and haggle over prices here and anger the hawkers as what I saw some Mainland Chinese tourists had tried to do. 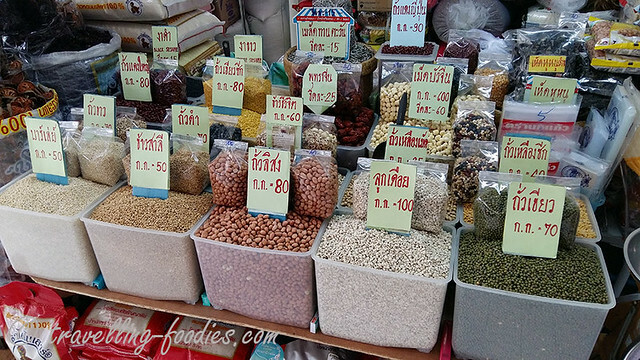 The Thais are generally a very friendly and hospitable bunch but don’t go overboard and provoke them to unleash their lesser desirable sides unto you. 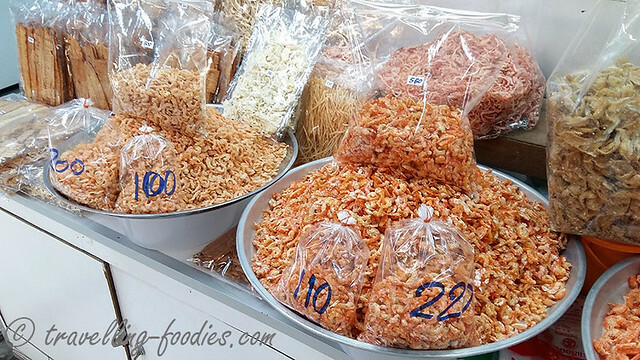 That said, don’t go chirping like a bird by saying “cheeeep cheeeep cheeeep” like a group of aunties from Singapore I saw, chatting loudly amongst themselves and trying to persuade each other to buy an item in bulk for a better discount from the hawker. 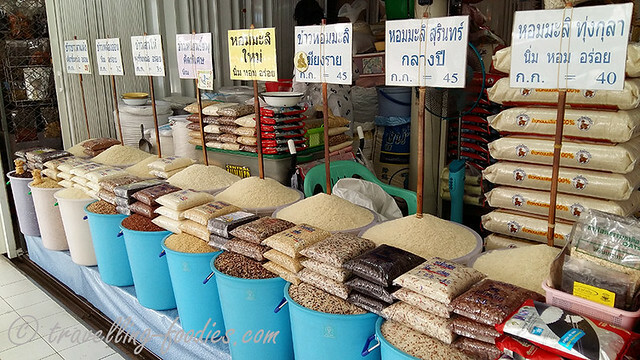 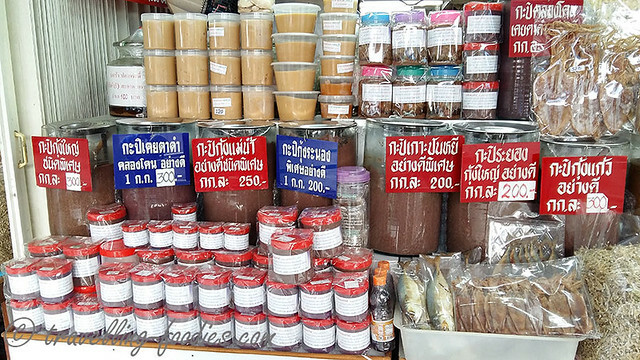 For all you know, the Thais being naturally entrepreneurial as they are, the prices will no longer be what you had enjoyed during the last visit. 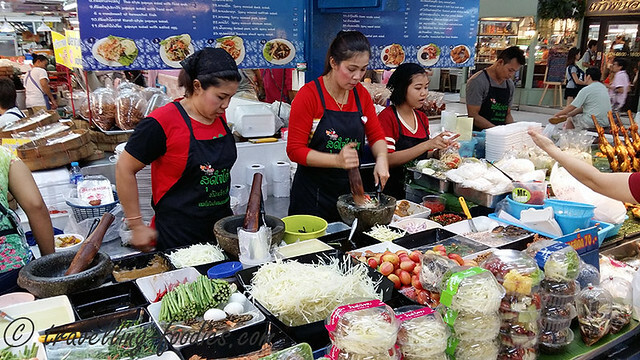 To get there, I would suggest taking the MRT and stop at Kamphaeng Phet station instead of taking the BTS which is quite a walk from Mo Chit Station. 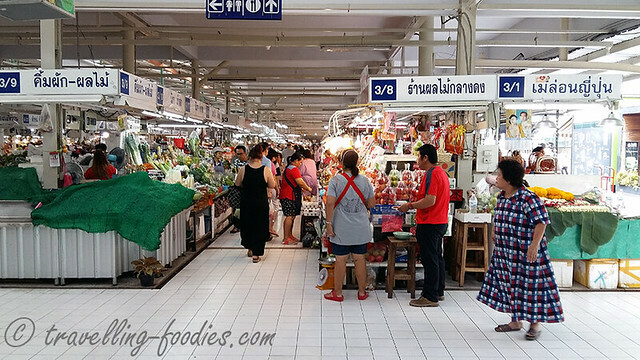 Simply get off at alight at Kamphaeng Phet MRT station and get out at exit three just next to the market. 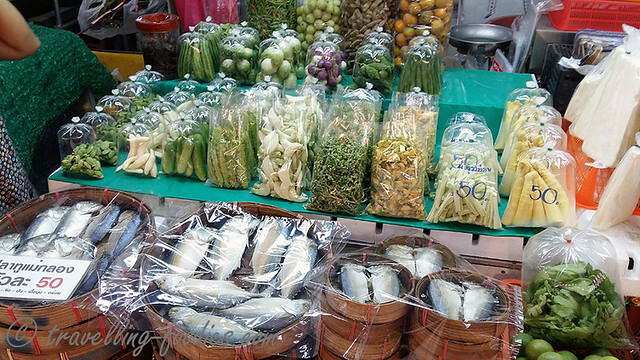 It opens as early as dawn and closes around dusk but the fresh food stalls tend to wrap up business just pass noon. 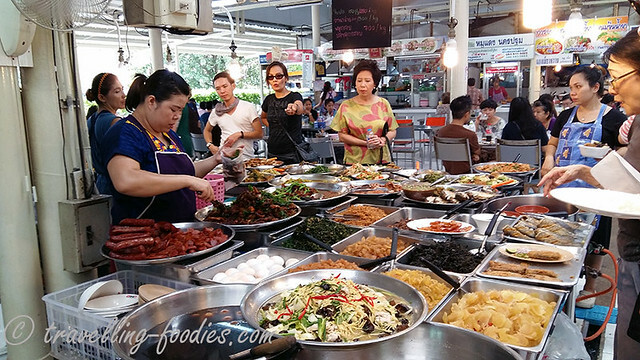 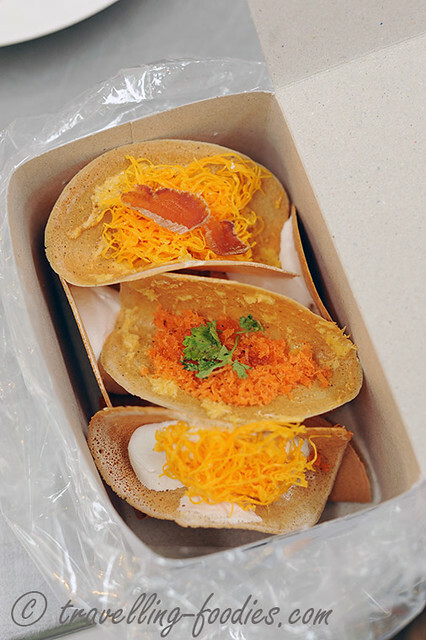 So try to go early, shop around and enjoy some local food there for brunch or lunch before heading down to ChatuChak Weekend Market next door for more shopping! 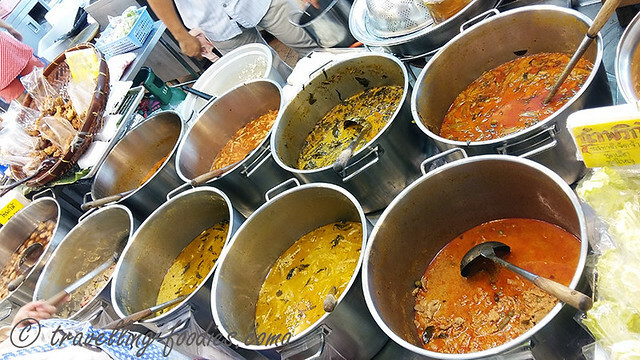 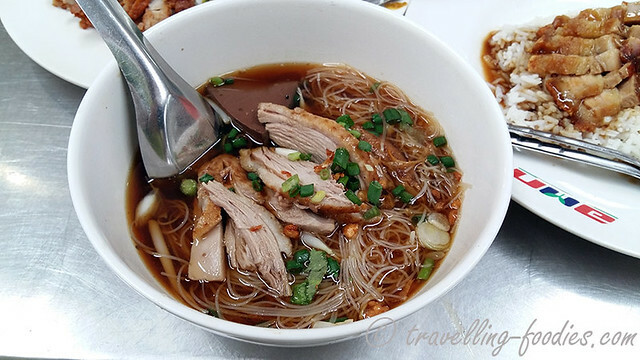 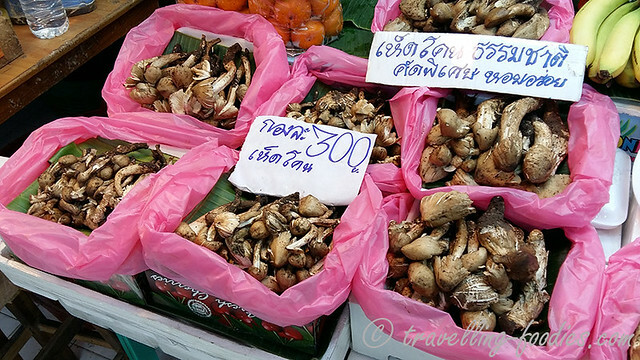 This entry was posted on December 18, 2015 by Alan (travellingfoodies). 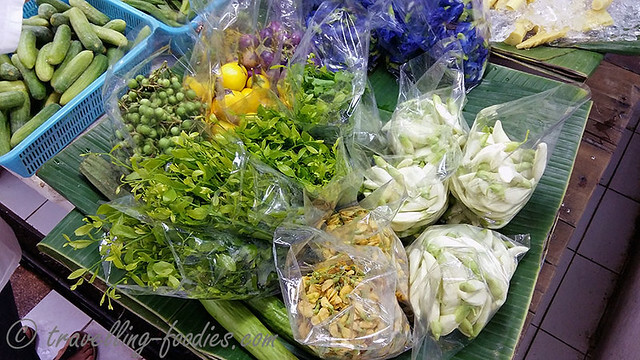 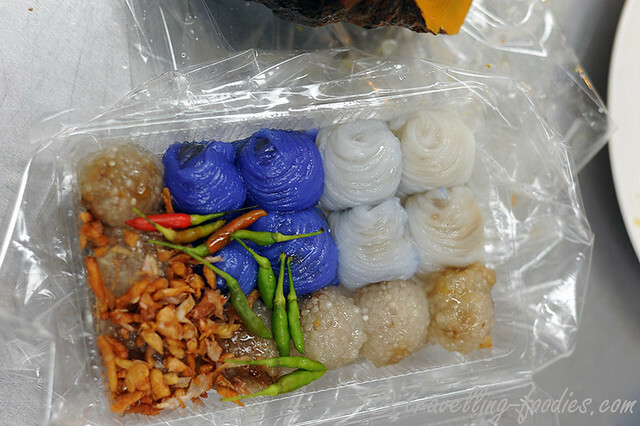 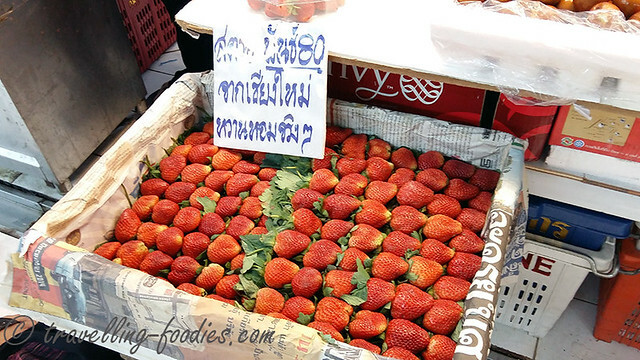 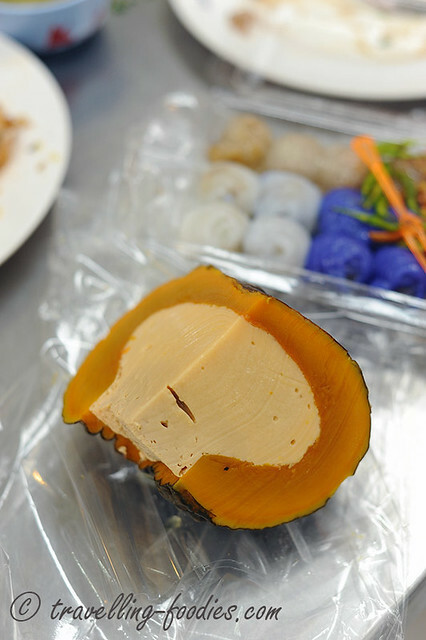 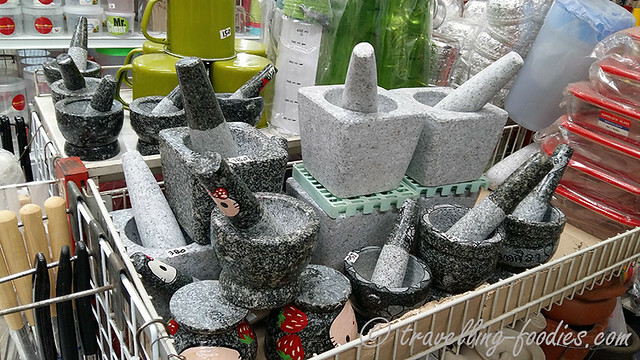 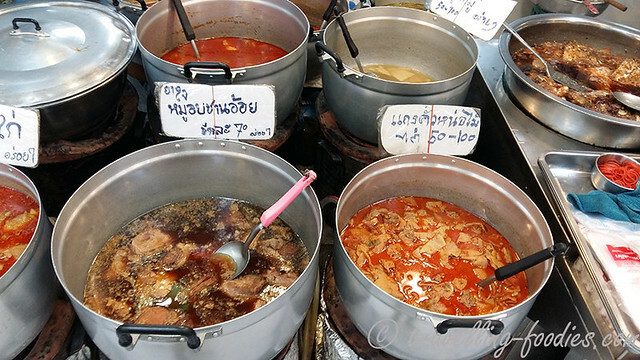 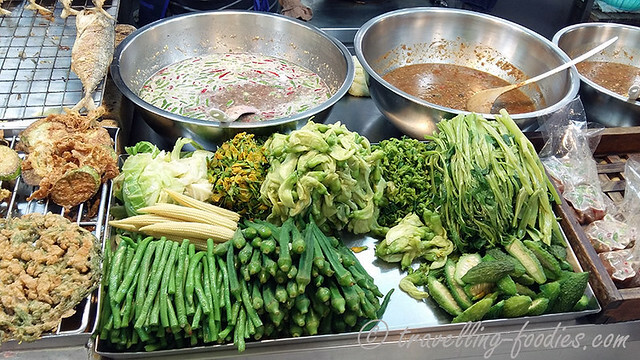 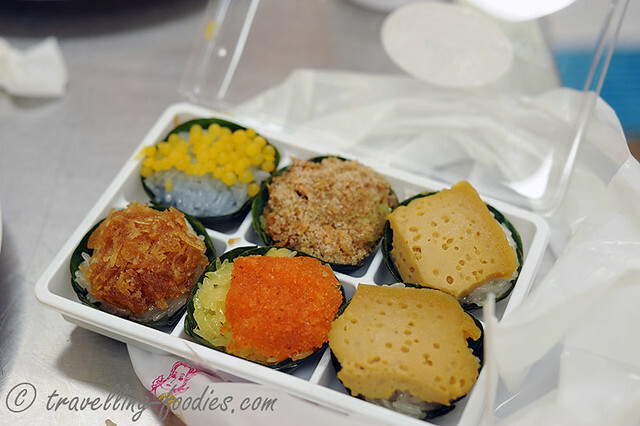 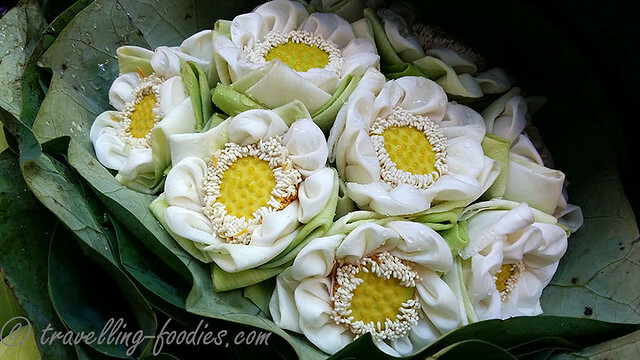 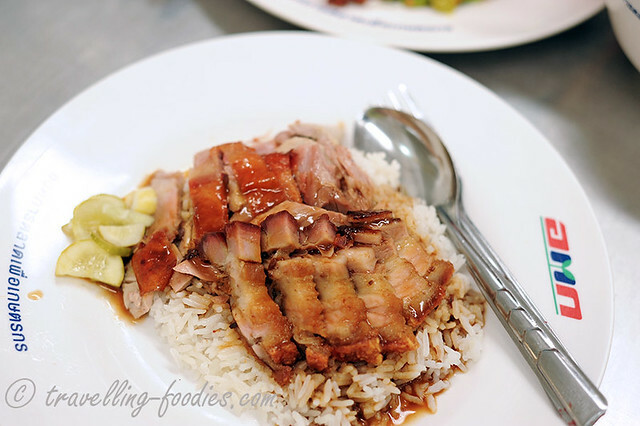 It was filed under Food, Travel and was tagged with bangkok, or tor kor market, thai cuisine, thailand.